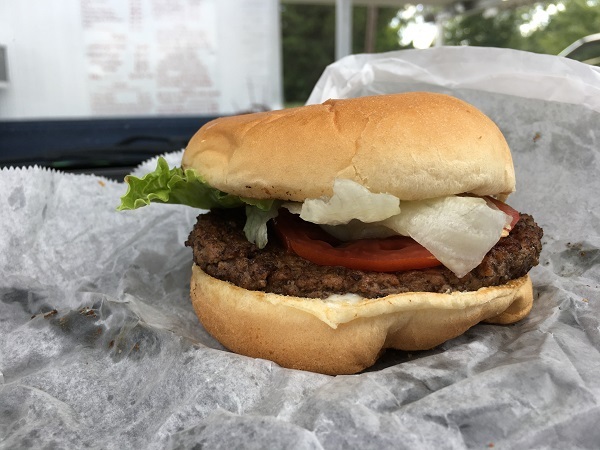 Shake Shack Drive-In, Cleveland TN – Marie, Let's Eat! 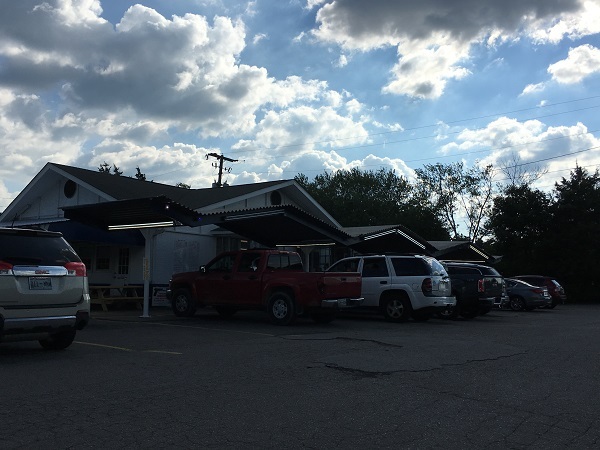 We stopped by this cute old canopied drive-in earlier in the year for milkshakes while on the way back from getting some barbecue, but I wanted to make another visit to try their food too. It’s pretty basic stuff, but it’s also pretty charming as well. In the previous chapter, I’d mentioned that one weekend in July, Marie and our son were out of town visiting family and I’m sorry to say that I was in very low spirits. I knew that a long drive with the windows down would improve my mood tremendously, and a milkshake would improve it even more. I remembered that this place made a tasty cherry milkshake. You can either get one with real cherries or with syrup. Perhaps I’m a heretic for preferring artificial syrup to the real thing, but while cherry is one of my favorite flavors for desserts, I don’t like having food bits come up the straw when I’m drinking something, so this place does it right by me! The Shake Shack, also known locally as either simply The Shack or, oddly, The Shak, has been open for almost sixty years. It is amazingly popular. Since I tend to have lunch and dinner a little earlier than many, I’m always surprised to see a restaurant nearly full right at six, but it was darn near packed. There are some picnic tables for people to use if they’d rather not eat in their car, but don’t come here on a Saturday at six expecting to find space there either. Cleveland’s a bit far of a drive for a fast-food quality burger like this one, but I felt like a drive and I felt like going someplace old. I could have had better closer to home, but every once in a while, I feel like changing my routine a little bit and just going somewhere comfortable even if the food isn’t all that special. But later this month, we’ll share a story about a place that was much further away from home, and where we drove a long, long way to get a burger that’s very, very special indeed. Besides, this burger was secondary to the milkshake and the canopy and the history anyway! Posted on September 6, 2017 September 6, 2017 by Grant G.Posted in burgers, chattanooga, tennesseeTagged burgers, chattanooga, cleveland, drive-ins, tennessee.